Your home’s electricity is delivered to your home through overhead wires or an underground feed. This feed is connected to your electrical meter socket. The electricity runs through the electrical utilities meter and is then routed to a device to shut off all of the power entering the home. 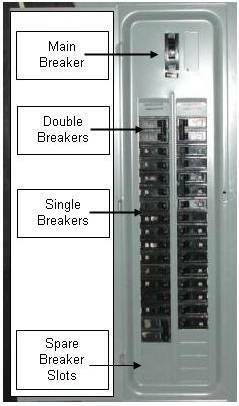 In newer homes, the shut off mechanism is a main circuit breaker housed within the electrical load center (distribution panel), see Figure 1. In older homes, this shut off mechanism will be an independent main disconnect switch, as shown in Figure 2, that will also contain the primary fuses. From a schematic layout, the electrical service is identical, it is only the physical attributes that have been updated, see Figure 2. 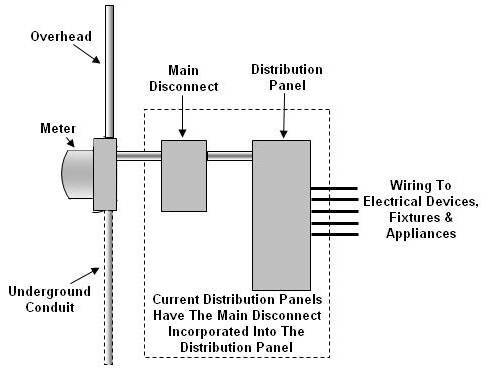 After passing through the primary disconnect switch with fuses or the main circuit breaker the electricity is sent to an electrical load center (distribution panel). The load center (distribution panel) does exactly what its name implies – it divides up the power and distributes the electricity throughout your home utilizing a number of circuit breakers or fuses to protect each individual circuit. In North America, our consumption of electrical power within our homes has grown dramatically over the past 30 years. Thirty years ago, a residential electrical service supplied 60 amps of electricity. Today, small homes will have a 150 amp service, a medium size home will be supplied with a 200 amp service and larger homes or homes with on-demand (tankless) electrical hot water service will have a 400 amp service. Similarly, the number of branch circuits that come from the distribution panel (load center) has grown. The standard 60 amp fuse panel generally contained two plug in fuse holders, one for the stove and one for the hot water tank and six or eight circuits. Today’s standard distribution panels will house 30 to 40 independent circuits and where 30 years ago, a kitchen was fed with one 15 amp circuit for all of the above counter receptacles and the refrigerator a new home will have a separate circuit for the refrigerator, a separate circuit for the microwave and each above counter receptacle will have its own 15 or 20 amp circuit.